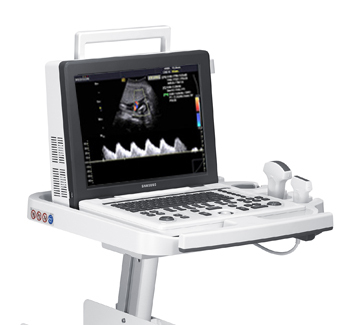 The Medison SonoAce R3 portable ultrasound is a color system packed with comprehensive diagnostic capabilities. It’s about as fast as machines three times its size, and the SonoAce R3 ultrasound delivers superior image quality with its Full Spectrum Imaging™ (FSI™) combined with a Speckle Reduction Filter™ (SRF™). Whether taking general OB/GYN images or heading to the sporting event for point-of-care imaging, the SonoAce R3 was designed to meet your needs and deliver exceptional results. While scanning, operators can view the resulting images from this ultrasound’s 15-inch LCD monitor. The SonoAce R3 also seeks to boost efficiency and convenience with its Full-Featured Workflow, a customizable measurement package, and body markers. QuickSan technology also boosts workflow efficiency through one-touch imaging parameters.